Hello there, before we go forward I want to let you inform about our another previous post on bullet and numbered list customizing with image hover effect. 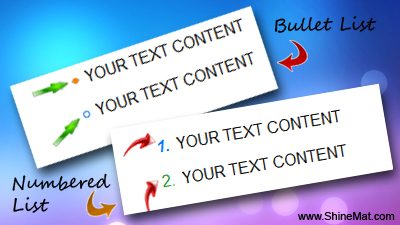 Today we are going to learn how to change bullet list style using hover effect without any images. Submit Blogger Sitemap In Bing And Yahoo. If you do not find this above code, don't panic. Try searching this below code. 7. Now replace this codes with the below codes. 8. Now, click Save Template to done. ■ You can use circle, disc or square as list-style-type. ■ Change color codes as your wish. Such as: #F6D58D etc. That's all. Now publish your post to feel a new twist of your ul and ol lists. If you face any problem please don't be late to ask me. With best wishes, good night. Have fun ! @Newton Shah Thanks for your nice comment and you can simply download this templete from internet. Just do a search "Ikhsan Magazine Blogger template" on Google and download it for free. Thanks a lot dear. Have Fun!